“The Idle Class,” (1921, 32 min). The Tramp arrives at a luxurious resort, stowed away in the train that takes the elite to their sunny summer playground. “Sunnyside,” (1919, 29 min). Charlie the handyman must mow the floor of a hotel and deal with the pesky cows and goats that have found a home in the church. THE CIRCUS, 1928, 71 min. Dir. Charlie Chaplin. The Little Tramp goes from being a circus loiterer who steals hotdogs from babies to an accidental clown in this delightful riot by comedic genius Charlie Chaplin. Don’t be fooled by the freewheeling slapstick throughout – the final shot evokes the heart-tugging yet adorable melancholia that makes the Tramp one of cinema’s most enduring characters. Double Feature: CITY LIGHTS, 1931, 83 min. Dir. Charlie Chaplin. Perhaps Chaplin’s best blend of comedy, pathos and class critique, this portrayal of the Tramp’s well-intended efforts to help a lovely, blind flower seller is one of the great classics from the director’s oeuvre. A WOMAN OF PARIS, 1923, 78 min. One of the rare Chaplin films not starring Chaplin, this romantic drama stars Edna Purviance as a woman who bounces back and forth between the security of a wealthy lover (played by the great Adolphe Menjou) and the passion of a poor artist. THE GOLD RUSH, 1925, 72 min. Coming off his first major financial failure, A WOMAN OF PARIS, writer-director Charlie Chaplin responded with what many consider his finest feature length film. The Lone Prospector (Chaplin) travels to the far-off Yukon in search of gold, but ends up falling in love with dance-hall girl Georgia Hale. The classic “dance of the dinner rolls” and “boiled shoe leather” scenes show Chaplin’s gift for poignant comedy at its very best. Plus “A Dog’s Life,” (1918, 40 min). A literal expression of Chaplin’s identification with the underdog. “A Day’s Pleasure,” (1919, 25 min). A family boat outing is complicated by tumultuous waves, traffic and a pool of tar. “Shoulder Arms,” (1918, 46 min). The comedy of self-preservation and patriotic fantasy comes to a head when the Tramp finds himself in World War I. 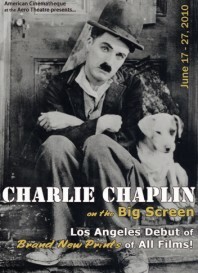 Celebrate Father’s Day with Chaplin! THE KID, 1921, 60 min. In perhaps his greatest film masterpiece, Charlie Chaplin’s Tramp, following his paternal instincts, takes a hapless, orphaned baby – “the Kid” – under his wing. Five years pass, and the tyke is now a precocious little boy (Jackie Coogan), helping his foster dad, the Tramp, in his “window glass replacement” scam. But a confluence of events, including the Kid’s sudden illness, conspire to separate the two. Plus “A Dog’s Life,” (1918, 40 min). A literal expression of Chaplin’s identification with the underdog. “Pay Day,” (1922, 28 min) Chaplin as a construction worker celebrates pay day by going to the bar – and trouble erupts. LIMELIGHT, 1952, 137 min. Dir. Charlie Chaplin. In this nostalgic but never maudlin swan song, Chaplin channels the riotous music-hall culture of his youth. An intensely personal film complete with recollections of his parents as well as his children in cameo roles, LIMELIGHT also features the one-time-only onscreen pairing of Chaplin and Buster Keaton. Double Feature: MODERN TIMES, 1936, 87 min. Charlie Chaplin directs and plays the Tramp in this brilliantly inventive critique of industrial advancement. When the Tramp begins to take on one too many characteristics of the massive machinery that surrounds him, the powers-that-be are made nervous by such anti-social behavior and suspect him of being a communist. Double Feature: THE CIRCUS, 1928, 71 min. Dir. Charlie Chaplin. The Little Tramp goes from being a circus loiterer who steals hotdogs from babies to an accidental clown in this delightful riot by comedic genius Charlie Chaplin. Don’t be fooled by the freewheeling slapstick throughout – the final shot evokes the heart-tugging yet adorable melancholia that makes the Tramp one of cinema’s most enduring characters. THE GOLD RUSH, 1925, 72 min. Coming off his first major financial failure, A WOMAN OF PARIS, writer-director Charlie Chaplin responded with what many consider his finest feature length film. The Lone Prospector (Chaplin) travels to the far-off Yukon in search of gold, but ends up falling in love with dance-hall girl Georgia Hale. The classic “dance of the dinner rolls” and “boiled shoe leather” scenes show Chaplin’s gift for poignant comedy at its very best. Double Feature: THE PILGRIM, 1923, 59 min. Chaplin plays an escaped convict who, upon discovering a suit of clerical clothes, makes the uniform his disguise. A smart and funny critique of religious pretense. THE GREAT DICTATOR, 1940, 125 min. Director Charlie Chaplin trades in the lovable bumbling of the Tramp for the hilarious but not-so-lovable bumbling of a strangely familiar Fascist leader in this brilliant work brimming with physical comedy and scathing political critique. “A time capsule, a timeless document and a profound work of conscience…See it with a crowd.” – San-Francisco Chronicle. Charlie Chaplin Shorts Program: “Pay Day,” (1922, 28 min) Chaplin as a construction worker celebrates pay day by going to the bar – and trouble erupts. “Sunnyside,” (1919, 29 min) Charlie the handyman must mow the floor of a hotel, and deal with the pesky cows and goats who have found a home in the church. “A Day’s Pleasure,” (1919, 25 min). A family boat outing is complicated by tumultuous waves, traffic and a pool of tar. “The Idle Class,” (1921, 32 min). The Tramp arrives at a luxurious resort, stowed away in the train that takes the elite to their sunny summer playground. More information as always from the American Cinematheque’s site, including booking details. Now, given Janus Films’ close relationship with the Criterion Collection, might the ultimate in Chaplin deluxe DVD releases be in the offing? At any rate, look out for Janus’ Chaplin website, coming soon. As a native of San Francisco, I can tell you I have never said this before: This makes me wish I lived in Los Angeles. Thank you for this. Presumably these are the same new prints from Janus Films, and American audiences can probably look forward to other such festival-type screenings.